Heidi Swain Looks Back On An Exciting Year As The Cherry Tree Café Prepares To Open for Business. 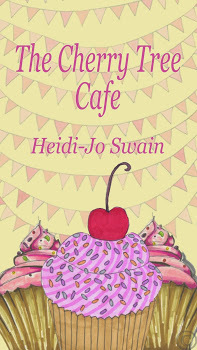 Here I am once more with Heidi Swain, busy sewing fabric bunting and chatting about her book, The Cherry Tree Café, which will be published this summer. Heidi, this is your third visit to my blog. Welcome back! Thank you so much for inviting me again. I’m beginning to feel right at home. I’ve even worked out where you stash the extra special biscuits! The first time you visited, The Cherry Tree Café was on Wattpad with a stylish cover designed by your clever daughter Millie. You must be so proud of her. Has she always been artistic? Have you saved the original art work? My darling girl is immensely talented, not that she believes me when I tell her that of course and yes, I am extremely proud of her. When I asked her to design the Wattpad cover I had no idea that within in an hour she would come up with something so pretty. I do still have the original art work and it will always have a special place in my heart. It was the first time I could actually imagine by writing appearing as anything other than words on a screen and I love her for giving me that moment. What were the benefits of using Wattpad? Wattpad is the perfect opportunity for sharing your work with a huge readership and receiving genuine feedback from both authors and readers alike. I appreciated every comment The Cherry Tree Café received because I knew that someone had invested the time to read, digest and then comment constructively. In my experience the writing community have been both enormously generous with their time and hugely supportive and I have ‘met’ some lovely authors, readers and book bloggers who I now consider firm friends. You are now a full member of the RNA - congratulations! The Cherry Tree Café went through the NWS process. Was that before or after Wattpad? What was the best piece of advice your reader gave you? Thank you. I can’t begin to tell you how proud I was the day my RNA membership card arrived (ironically it was February 14th) and then a few days later when I saw my details added to the Author A-Z on the website the excitement really cranked up a notch! I uploaded the Cherry Tree chapters to Wattpad, one per week, after I’d edited the manuscript and put in place the suggestions made by the RNA reader. It would be impossible to single out one piece of advice as it was all invaluable. Tell us how you came to submit to Books and the City. I discovered, through the joys of social media, that on July 15th 2014 Books and The City were accepting unsolicited submissions. Needless to say I prepared my submission, hit send on the 15th and well, the rest is history. Ironically, The Cherry Tree Café will be published on July 16th this year. How is it possible that so much can happen in literally just twelve months? Were you private about your writing when you started or did you tell everyone what you were doing? What do your colleagues and non-writing friends make of your success? I was very private about my writing when I started out. Confidence is a fragile thing and mine was (and some days still is), wafer thin! It took me a long time to tell everyone how I filled my days when I wasn’t working and even longer to share any of my work. Everyone has been very supportive. I didn’t tell anyone other than close family members that my work was being considered by a publisher so when the Book Deal Moment finally happened there were plenty of surprised faces! I’ve had lots of people getting in touch to me that they have pre-ordered the novel already which is thrilling and terrifying in equal measure. Will you be having a book launch party? In the real world, or a virtual one, or both? Ideally I would like both! At the moment I’m thinking of having a virtual celebration on the 16th followed by a little gathering at home around the 18th. It would be rude not to hang the bunting and bake a batch of cupcakes in Lizzie’s honour, wouldn’t it? To be honest, it doesn’t feel as if it has happened all that quickly and I’m constantly kicking myself for not putting pen to paper sooner. I’ve always known I want to be an author but as with lots of other aspiring scribblers, I’ve struggled with confidence and skirted around the issue before finally deciding, about six or seven years ago, that enough was enough and it was time to get going. My only piece of advice would be not to waste one second of time. Lots of people tell me they are going to write a book ‘when they have time’. Ok, so when will that be? When will this magical gift of time be delivered? In short, it won’t. Just grab a notebook and pen and get on with it, now. So many good things have happened close together. Pick one and give us a flavour of it. That really is asking the impossible! With Simon and Schuster I have been gifted a hugely supportive team, a patient and oh so clever editor, not to mention a whole host of amazing cake experts. How can I possibly narrow down just one moment when there’s the email expressing interest in the manuscript, the trips to meet the team, the offer, the contract, the announcement… they are all equally as thrilling and still rolling in. However, telling my darling husband Paul, that I’d been offered a deal was a major stand-out moment. I didn’t think anyone could be happier than I was that day, but he was. It was incredibly moving to see his reaction. The pavement outside the Simon and Schuster offices on Grays Inn Road will always have a special place in my heart! You recently started writing your third novel. What can you tell us about it? Also, when can we expect to see your second published? The third novel is based around a character we’ve already met at the Cherry Tree but I’m not going to tell you which one…sorry! And with regards to a publishing date for the second I can’t reveal that just yet because I don’t have one. However, I’ve been asked down to London on the 16th of this month to attend the Books and The City Spring Blogger Event so I’m hoping to find out more then. The event itself is going to be great fun but I still can’t believe I’ll be sitting on a panel with the likes of Milly Johnson and Jane Costello answering questions and trying to hold my own amongst such illustrious company. If you’d told me all this a year ago I would have thought you were having me on! Heidi, it's been such a pleasure hearing all your news. Lots of good wishes for the future. Come back any time. The Cherry Tree Cafe is available for pre-order on Amazon. Click here. Thank you for your generous comments, Jen. I'm so glad you enjoyed the interview. What a lovely interview. I really felt as if I was sharing tea and biscuits with you both. Thanks to Susanna for asking the questions, and Heidi for the helpful responses. What a lovely thing to say, Frances. I'm so glad you enjoy my interviews. Thanks for dropping by. Wow, Heidi, you've done so well. I'll be reading the new book as soon as it's published! Susanna, I love your interviews! Thanks for your kind comments. I read the Wattpad version of The Cherry Tree Cafe last year, so I've had a taste and I know it's well worth reading. What a fab interview- great advice- and massive congratulations Heidi- we're looking forward to your book! It's always a pleasure to interview Heidi. She is always generous about giving full answers. Thanks for dropping by, Tanya. love this interview it sounds so cosy.